Get close to the wilderness and enjoy the amazing mountain scenery in the horse back with McKenzie Trails West! Ride through the breathtaking Coral Creek Valley that will get you an amazing experience. You can also relax around the evening campfire after the horseback riding, reliving the excitement of the day and sharing some tall tales with fellow travelers. This is definitely the holiday you will never forget! Like travelers of days gone by, a tent will be your home as you explore this majestic wilderness. Everything must be packed in and out by a horse. McKenzie Trails West supplies cots, foam pads, and ground sheets so you can sleep in comfort, well protected from the elements. Wake up in the crisp mountain air to the smell of fresh coffee, pancakes, and bacon! The trail cooks will delight you with their daily mealtime surprises prepared on the small wood stove which is packed in and out on horseback. Plenty of good home cooking to satisfy the heartiest appetite. After a long day on the trail, it is great to relax around the evening campfire reliving the excitement of the day and sharing some tall tales with fellow travelers. Friendships flourish in the glow of the embers, many which last for years! Helmets is available upon request. Smoking is prohibited on rides. Drinking is prohibited on rides. This vacation will take place in Alberta, Canada. This is one of the last sizeable tracts of mountain wilderness in Alberta that has been spared from highways and commercial development. It is home to many species of wildlife which often present themselves for exciting photographic opportunities. 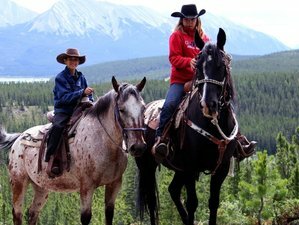 McKenzie's Trails West is a family outfit with a 50-year history of guiding pack trips and trail rides.